We’re super proud to bring you a major advance in the Celestion Impulse Response range – our new bass impulse responses! Capturing the tones of our bass speakers with the same level of accuracy that has come to be associated with our guitar speaker IRs, has certainly proven to be a significant technical challenge. But, being the perfectionists that we are, we simply couldn’t rest until we’d created bass impulse responses that are every bit as good as our current IRs. So, let’s take a look at the speakers we’ve captured, and find out what’s different – and what’s the same – about our bass guitar speaker IRs. 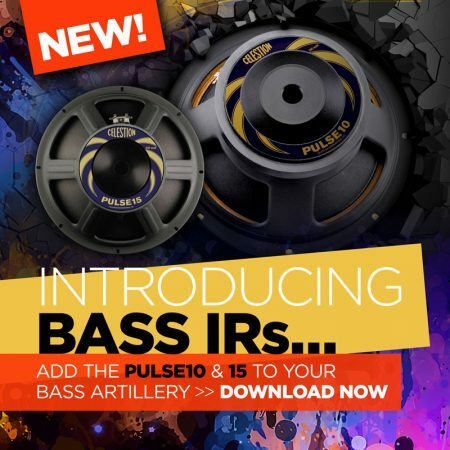 Our first bass IRs are for two of our most popular bass speakers: the PULSE10 and the PULSE15. With a strong steel chassis, round copper voice coil, Ferrite magnet and Kevlar-loaded, straight-sided cone, each speaker has been expertly designed to provide not just depth, power and excellent articulation, but also to deliver a top-end ‘zing’ – a much sought-after bass tone characteristic. The Celestion PULSE10 is a 10-inch bass guitar speaker which offers a huge 200W of power and a low frequency range of 45-3500Hz. It’s a bass speaker which can be used on its own, or more commonly in pairs or quads. The Celestion PULSE15 is a 15-inch speaker with even more power (400W) and an even deeper tone (40-3500Hz) than the PULSE 10. With that much power and depth available, players rarely need more than one! The first key element of IR capture was to select microphones that are especially suited to the lower frequencies generated by our PULSE speakers, while also not missing out on any distinctive midrange or high frequencies present. Sennheiser MD421 – The MD421 was also used on our regular IRs but can pick up frequencies down to 30Hz. In addition, a five-position bass roll-off switch gave us plenty of choice about how the lower frequencies are captured. Neumann U47 FET – The Neumann U47 FET has an extremely flat frequency response right down to 40Hz, making it a great choice for picking up the low-end as accurately as any midrange frequencies. AKG D112 – The AKG D112 is intended for use with low frequency instruments such as kick drum and is perfect for picking up super low frequencies down to 20Hz. Neumann TLM 107 – The TLM 107 is the same room mic as we use for our guitar speaker IRs. With a very wide frequency pickup as low as 20Hz, this is a microphone that works just as well for capturing our bass speakers as our treble speakers. Neumann KM84 – With a frequency pickup ranging between 40-20,000Hz, this mic was positioned to capture the driver’s initial high frequency ‘attack’ element of a bass guitar note. This can be adjusted in-level by the player or turned down completely. We’ve selected the same six microphone positions as were used for our regular IRs, giving you six tone options per microphone, referred to within the files as Balanced, Fat, Thin, Bright, Dark and Dark2. This gives you a base of 18 IR files per cabinet. The TLM 17 room mic was also positioned in the same way as for our current IRs, to give a further three options – Left, Right or Stereo. The KM84 was positioned to capture any high frequency elements present, giving you the option to mix some additional HF into your tone. Any of the files can be mixed together within your DAW or amp modelling software to give you a high level of control over the final tone. As for our existing IR range, we’ve also pre-mixed a number of the mic options for you (e.g. MD421 plus U47 FET), giving you yet more ‘off-the-shelf’ tone options to experiment with. The PULSE10 impulse response is available in two cabinet options – 2×10 and 4×10 – which can be bought individually or as a pair. The PULSE15 is available as a 1×15 cabinet IR. All three can be bought together at a discount using our 3 Cab Pick and Mix option. Our new bass IRs are fully compatible with all our existing impulse responses. They are all in .WAV format – so you can load them quickly and easily into whatever gear you are already using for your other Celestion IRs. You can then freely mix and blend with any IRs in our range, to achieve the tones you want. Download our new bass impulse responses here. As well as providing a high-quality IR solution for our bass playing customers, we expect our new bass impulse responses to open up a whole new world of tonal possibilities for treble players too. We can’t wait to hear what you think of them! Talk to us on Facebook or upload your own videos to YouTube showing us how you’ve used them.